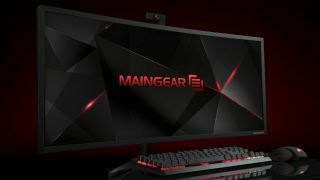 Maingear has unveiled a gargantuan all-in-one gaming PC with drool-worthy tech specs that includes Skylake processors and a full-size graphics card – with users being able to spec the latter up to a GeForce Titan X, no less. The Maingear Alpha 34 is an all-in-one machine with a curved 34-inch screen boasting a resolution of 3440 x 1440 (with a 21:9 aspect ratio) for some seriously immersive gaming. You can specify it with a Skylake CPU – up to a quad-core Intel Core i7 6700K running at a base clock of 4GHz, with the possibility of overclocking, too – along with a GeForce Titan X 12GB graphics card as mentioned, or a Radeon R9 390X 8GB if you prefer to go with AMD. Alternatively, the Alpha 34 can be specified as a workstation with an 18-core Xeon processor and a professional workstation graphics card. As for the other components, this beast can be decked out with a Samsung 950 Pro M.2 NVMe SSD and has a pair of 2.5-inch drive bays for SSDs or HDDs, plus it supports up to 32GB of system memory. Maingear also notes that this machine is fully upgradable just like a desktop PC, so there's no worries about the hardware starting to feel more underpowered in a few years' time. As a bonus, you can also decorate this AIO with your own custom paint job which Maingear will apply, and you get a no bloatware guarantee, which is always good to hear. So, ready for the price tag? The base "performance gaming" configuration runs to $1,999 (around £1,360, AU$2,790).